Antiques challenge. 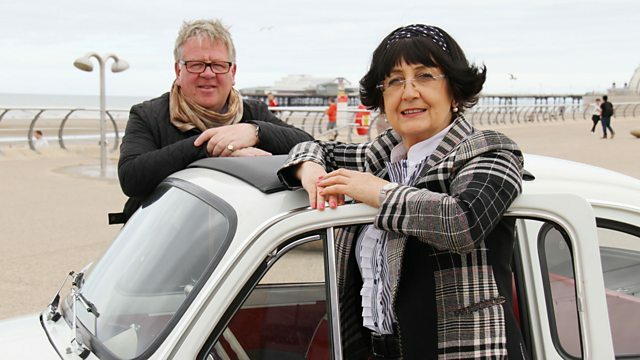 Auctioneers Anita Manning and Philip Serrell begin their journey in the Lake District, heading to their first auction in Cleveleys near Blackpool. Today, we begin a brand-new adventure with Road Trip royalty. and king of doing a deal Philip Serrell. -and you're sitting beside a beautiful woman? Everywhere I go, people say to me, "What's that lovely Anita Manning like?" -and do you know what I say to them? -What do you say, darling? What a diva. What an absolute diva. Don't listen to him, Anita. is more of a smiling assassin when it comes to getting a discount. I was kind of looking to pay about £20. Her rival on this journey is esteemed auctioneer Philip. Full of fun and games. pootling around in a left-hand-drive 1966 Fiat 500. Do you think I should get out and push? Do you? I think... I'm not sure whether you drive this or wear it. They are snug in there, aren't they? and ending their trip in Crooklands, Cumbria. and finish up at auction in Cleveleys, near Blackpool. Anita Manning, what have you done to this weather? -What do you call this in Scotland, dreich? -because we're at the beginning of a new adventure. We're in the heart of the Lake District, in wonderful Windermere. Philip's arrived at Courtyard Cottage Antiques. -I've seen you're selling your shop. -No, you're a little short. I'm sorry. Story of my life, that. -I'm going to have a look round and I'll catch you in a minute. Nice try, Philip. Best find something a bit more in your budget, eh? What are these off here? Are they off a buffalo or a bison or something? Do you know what the difference is between a bison and a buffalo? I'll try my best Birmingham accent. -You can wash your hands in a bi-son. SAD TRUMPET SOUND It's the way you tell them. Oh, Lordy. -I'm sorry. You all right? Terrible jokes aside, let's get a closer look at those horns. -How much are these, Jean? -They're just a cow's horn, aren't they? So it's just a by-product of what it is. -There's no actual hunting gone on just for these. What I'm trying to say is, they're not a trophy, are they? -Look at this. Look at it. Philip's putting the dusty cow horns aside as a possibility. has also caught Philip's eye. That at auction is going to make... 20-30 quid, isn't it? I like it when it's "ooh, 'eck". So is that a Lake District expression? I want to buy the horns. The horns can be 45. How much can you do the two for? I agree with you at £50. -I want you to be happy. Go on. I'll shake you by the hand, my love. Thank you very much. securing the cow horns for £25 and another 25 for the stool. ..known as the Auld Grey Town thanks to its grey limestone. an essential prerequisite of today's explorers and mountaineers. Anita's first shop of this trip is the Antiques Emporium. there's bound to be something to suit Anita's taste here. Cabinets always fascinate me. I'm always drawn to the cabinets. are a yellow-metal amethyst-set bar brooch and an Art Deco clip. And I think it might be a wee bit more modern than that. I think that it's a replica, rather than a period one. It's not absolutely right, but at the same time, it's a nice thing. come along to auction and fancy giving themselves a wee treat. if there's any movement on the ticket price of £42. -The very best I can do is £32. Because I like it and I think that it's nice. It's only the sort of period that worries me a wee bit. Do you think they would go to 30? -Go on. You've twisted my arm. -I don't want to twist your arm. -You've sweet-talked me into it. We'll do 30 for you. She's spotted something else in the cabinets. I'm intrigued by this little plaque at the back. -Could I have a wee look at it, please? but neither Chris nor the dealer know anything more. Is Anita willing to risk purchasing this mysterious lot? The ticket price is £22. There's a little bit of leeway on it. We can do £18 for it, and that's his bottom line. is somebody else going to be as interested in it as me? -It just needs somebody interested on the day, doesn't it? -Yeah, I'm going to go for it. and Art Deco pin bought for £48. Philip is now joining Anita in Kendal. housed in a 17th-century manor house. Philip's being looked after today by dealer Andrew. -You've got interesting things everywhere here. what's the longest you've ever had anything in stock for? Well, we sold something the other day that we'd had for 40 years. -40 years?! That's nearly as old as me. -Did you make profit on it? -We did make a profit on it. -I tell you what, I love that, Andrew. You've got a handcrafted pub game there, skittles. -Somebody's made this who goes to the pub, haven't they? All you've got is a bit of stained hardboard here. It was probably made in the '50s, just post-war. Well, have a go, then. I'd say you'll get five. So, what's the ticket price on that, Andrew? We've got a ticket price of £80. -And there's some movement in price on that? -Knock it down a bit. Sounds like the skittles are in the running. Andrew, this is fantastic, isn't it? That's a wonderful example of polished fossils, isn't it? -What's interesting... I used to teach geography. But I would think this is several million years in age. -And as you say, it's been polished. Would this have come from Africa or Morocco or somewhere? you never know where these things come from these days. -We've got a ticket price on that of £75. -I would imagine it would be. It's probably one of the oldest things in the shop. -It's not as old as you and me, is it? have a combined ticket price of £155. -The fossils will make £40-£60. Realistically, I think I can give £30-£35 for them. For me, the game is £20-£25 worth. 60 quid for the two. Well, £55, £60 for the two. Call it £65 and we'll have a deal for you at that. -So what we're talking about is £35 for the fossils. -And £30 for the game. I will shake you by the hand. -Thank you very much, I'd better give you some money now! A very generous discount, and a great deal done. Marvellous! of the most famous children's novels of all time, Swallows And Amazons. and rumours still persist that he may have been a spy. is Geraint Lewis from the Arthur Ransome Trust. We associate Arthur Ransome with the Lakes. -How did this association start? Was he born here? He was born in Leeds. of the Old Man of Coniston as a sort of welcome to the area. from childhood holidays at Coniston Water. I suppose he carried this area in his heart with him. he carried a little rock throughout his life when he travelled. and started publishing his work to great acclaim. led Ransome to St Petersburg in Russia. Did he do any work over there, apart from his writing at that point? for him to become a war correspondent for the Daily News. That is the perfect job for him, telling stories. reporting on the rapidly evolving politics of Russia. It must have been a very scary time to be in Russia at that point. through that kind of period. and what their mind-set was. Are you telling me that he was a spy? or encourage, the Russian government to let him back into Russia. what was going on in a country which at the time they knew nothing about. Within this elite circle, he got to know one person particularly well. He married Evgenia Shelepina, who was Trotsky's secretary, in 1924.
and they went to live near Windermere. So he came back, he brought his Russian bride to live in the Lakes. conceived the idea for his children's novel Swallows And Amazons. What inspired him to write this book? It was two inspirations, really. led to the creative inspiration for Swallows And Amazons. enjoyed by two families of children. children's authors of all time. And I think one of the most respected as well. Swallows And Amazons series, Pigeon Post, and we have the medal here. That is quite something, isn't it? so it's certainly an award to treasure. died in June 1967 and was buried in his beloved Lake District. and have sold millions of copies worldwide. who are back together again for some well-earned rest. It's the next morning, and, hello, what's going on here, then? Looks like the car has finally packed in. Our experts will have to think of a new mode of transport. There's a couple of gee-gees up there. No, I don't like horses. I think we should retitle the programme. What about The Great Antiques Walk? Or should I say skip? Yesterday, Philip secured himself four lots. and the slab of fossils, which means he still has £85 in his pocket. While Anita only bought two lots. leaving her £152 available to spend. to her first stop of the day, in Cullingworth, West Yorkshire. the pretty village of Cullingworth is home to Antiques at the Mill. -How are you? How do you do? -It's lovely to be here. What a fabulous place. Was this originally a textile mill? That's right, an old textile mill that goes back to the 1800s. It's now filled with the wares of over 30 independent dealers. that Phil Serrell would be immediately drawn to. but it's an interesting looking thing and it has age about it. It's had a wee bit of repair. So, it says on the ticket that there is a rustic rake and shovel. So we've got a rake as well. Steve, do we have the rake for this? We do have the rake. It's right above my head. -Can I see it down? So, no great quality, but probably late 19th, early 20th century stuff. She sounds keen, so it's time to phone dealer Paul. I was kind of looking to pay about £20 on them. Well... You don't get if you don't ask. £25? Could you take £25? You are an absolute darling! An absolute darling at £25. I'm really delighted. OK, bye-bye. Bye. -You got a really good deal there. Well done. I was chatting him up. This little sewing box here would be from the 1950s. and it's decorated with this quite crazy Fablon material here. And I think that it might be appealing. but Anita has asked Steve to contact the dealer with a cheeky bid of £30. so £30 is a bit low. He will shift it at £40. -Let's go for that, thank you very much. I'm delighted. and the rustic rake and shovel for a canny £65 total. a few miles north of Bradford. thanks to the textile boom. so he created a vision of industrial utopia. to meet curator Jen Hallam to find out more. Titus started off his career as a wool stapler. -It's somebody who buys and sells wool. -So he's a wool trader? and they were full of alpaca fleece that nobody wanted. so this is the product of that invention. is incredibly fine and lustrous fabric - very, very popular. flock of alpacas at Windsor, used to send the fleece up to Saltaire. Titus Salt's successful business flourished. but was aware of the terrible living conditions of his workers. Living conditions in Bradford were absolutely appalling. and the father, mother and grandmother sleeping in another bed. There was no sewerage, no water supply. The canal and the Bradford Beck were basically open sewers. and an awful lot of people died. -So they didn't live overly long, did they? The average lifespan in Bradford at that time was just 18.5 years. children didn't make it to the age of 15.
thought to be the largest in Europe when it opened. of well-fed and happy operatives. Salt actually built a village for his workers with 800 houses. He built churches, a school, a hospital, almshouses. that could accommodate 700-800 people at one sitting. Every house had its own water supply, gas supply. It had a minimum of two bedrooms. In 1876, the last building at Saltaire was completed. Later that year, Sir Titus Salt died at home. the terrible living conditions of industrial workers. Anita is using her initiative. I feel like the queen of the road! I'll look after him and I'll be careful. OK, darling, we're off. Forward, Macduff! And you're a lot better looking than Phil Serrell. A lorry and a car ride later and Anita has arrived in Hebden Bridge. popular with those who prefer a more sedate way to cross the Pennines. Anita is here to visit Caldene Antiques Centre. -Can I have a wee look outside? -I want to try and find a hallmark. -See if there is a hallmark. which is from the 1930s or 1940s. It's marked up at £22. there would be interest from people who buy gold. But I like the colour. I like the colour of the watch case and I think that might be gold. ..and then I am looking in here for the hallmark. So that's a good buy at £22. Great spot, even better if she could get it for less. Time to check with Carol. Is there any movement on that price? -Are they both out of the same cabinet? -We could do that one for £20. -You could do it for £20. Could you do it for £18? -You can do it for 18. That's fine, that's fine. -That's great. Well, I'm very pleased. So that's a nine carat gold cased lady's wristwatch for only £18. Philip is also heading towards Hebden Bridge. It's a lovely part of the world, isn't it? He's hitched a ride with Roy and his grandson George. This is fantastic. Really, really kind of you. Roy is a man of few words. not surprising as Philip hails from generations of farmers. And dropped off right at the door of his final shop. Lucky devil. What a really, really nice man. Right, down to business at Hebden Bridge Antiques. -That was some entrance, that was. -Well, you know, travelling in style. You're welcome to have a look around. there's that silver ship's light and it looks like it's 47 quid. It's a cigar lighter. Hugely collectable. So if that's all the money, that is just for nothing. "than to arrive in disappointment." Anything else silver and cheaper take your fancy? Very often, these have had an armorial or something here. -Yes. Quite often they do, yes. -That has been polished out, hasn't it? But it's got some nice gilding to the interior. This is a helmet-shaped cream jug. This is a Georgian design that's been copied 100 or 80 years later. What do you think that'll make at auction? -Yes, that's exactly what I think. Which means I've got to try and buy it off you for £20-£25. -What's the price ticket? £80! Um... What can you do it for? For me, it's got to come in under £30, otherwise I can't look at it. Why don't we try £45? -That's not under £30, is it? For me to buy it, it's got to come under £30, really, I think. That's still got to make £40 for me to stand still with it. I could go to £25 for it, if that's any good to you. If it isn't it doesn't matter, but I could give that for it. How about pushing it slightly and go £28? Go on, then, you're a gentleman. Thank you very much indeed. With that very generous deal, both our experts are all bought up. and the Georgian-style cream jug. and the vintage lady's wristwatch. I love Phil's items, they are so Phil. Anita has bought some really good Anita lots. But she has also bought a couple of Phil Serrell lots. The rake and the fork... I mean, that's Serrell country, Manning. You know, she's bought them right enough, they should do money. That sewing box, I just do not understand that. The cow horns, or the bull horns, they don't press any of my buttons. because I have had a ride on a tractor. I'd rather have a ride on a tractor than a concrete lorry. Hmph! to their very first auction of the trip in Cleveleys, near Blackpool. Let's hope their now-fixed car makes it. Do you know, the thing is, our road trip is like a rollercoaster. The "Auction Sale Big Dipper". We've had the highs, we've got the lows to come now. Well, don't worry, Phil, as you've made it safely to the auction house. OK, my old fossil, are you ready for this? I'm going to find a fossil, I think. In we go, then, happy days. So, what does he make of our experts' lots? possibly maybe for a themed pub or something of that interest. to be absolutely honest with you. these particular 1950s, 1960s items, so might do well. Time will soon tell. Get comfortable, everyone. -Whoa. Packed room, isn't it? First up is Philip's child stool. Will it prove to be a crowd-pleaser? -Do you need me to hold your hand? -£20 for this. 10. 10 I have. 12. At £20 at the back. 22. At £26 on the front row. 28 anywhere? At £26. -Why are you cheering for me? -Can't argue with that, really, can you? There was a little love in the room for Philip's stool, too. Just a little question here. Is Joan of Arc big in Blackpool? -So, for this one, £30. 20 I have. 22. At £22. 24 anywhere? 24. 26. 28. At £28 on the staircase. 30. -She IS big in Blackpool. -She's very big in Blackpool. -It is getting bigger by the minute. -£38 on the second row. 40. At £44, are we all done at 44? -It's put me firmly in my place, hasn't it? Indeed. That's a storming start for Anita. -I wonder if it will be lady's day today. Now, now, no need to be bitter. Let's see if your pub skittles game will prove popular. Come on, 30 I have, 32. At £32. 34 anywhere? At £42 at the back. 44 anywhere? At £42 for the skittles game, then. £42. 44 anywhere? Are we all finished at £42? Surely you can crack a bit of a smile over that result. If you're in Liverpool, you're a Liverpudlian. If you're in Blackpool, are you a Blackpudlian? -I think I've lost her. -Sometimes I worry about you, Phil. the rustic rake and shovel. 22. 24, £24 at the back. £24. -26 anywhere? At £24 at the back of the room. -At £30 at the back. -30, then. Are we all done at £30? 32 anywhere? -All done at 30. All finished. That's another profit for Anita. Great stuff. -Philip is playing catch-up with his cow horns next. At 10. 12, at £12. 14. 16. 18. 20. £20 on the front row. 22 anywhere? At £20 for the cow horns. Are we all done at 20? All finished? Ah, that will take the sting out of that loss. Next up it's Anita's great find, the gold wristwatch. 32, 34, 36. At £36. 38 anywhere? 36, are we all finished? At £36, all done at 36? Another marvellous profit for our Lady Manning. For me, that's got that sort of November 5th look. Very popular, these. What can I say for this one? £40, or 30 I have? -32. 34. At £34. 36 at the back. -I don't believe it, I just do not believe it. -My flabber is completely gasted. At £60, are we all done at £60? All done. Look at that, she's done it again! Oh, Philip, this is not your day, is it? Can you redeem yourself with your slab of fossils? 20. Well, 20 I have. 22. At £22. 24 anywhere? At £22. 24, 26. At £32, the gentleman sat down on the second row. At 32. Are we all finished at 32? Do you know, I think you've hit the nail on the head there, Phil. It's Anita's last lot now. Can she continue her run of profits with her brooch and Art Deco clip? £30 for those. 20. 10 I have. 12, 14. At £14. 16 on the stairs. 18. 20, 22. 24, 26, 28. 38. At £38. 40 anywhere? 40. At £40, then. £40 at the back of the room. Have we all finished at 40? 40 is good enough for me. I'll say so. Anita ends on a high. I think for you to win, your cream jug will have to get £3,000. Hey, it's unlikely, but stranger things have happened. -And you're away, you're away. -44. 46. 46. At £46. At £46. All finished at 46? 48. 50. So £50 at the back, then. At 50, then. Are we all done at 50? All done. Might just have clawed me back to what I started with. A great result to end on, so well done. Before you have tea, let's work out the final figures. Philip started this leg with £200. leaving him with £196.40. Bad luck, old chap. Anita also began with £200. and goes into the next leg with £242.43. Phew! Well, well, well, well. and me and my fossils are down about a fiver. See you next time, road trippers. Not sure about the car, though. Next time, our antiquers head to north-east England. Do you think we are on the right road? ..and Anita wants to hang on to her lead. I wonder if I can give Phil Serrell a hammering with that? Auctioneers Anita Manning and Philip Serrell begin their journey in the Lake District, continuing on to West Yorkshire before heading to their first auction in Cleveleys near Blackpool.